KillerRONS.COM's owner, James Monroe, has been around drag racing his whole life. His father (Mike Monroe) began competing in 1964 and is an integral part of the racing team even today. After graduating from college and competing successfully in intercollegiate athletics James decided that driving the family race car was what he wanted to do to fill the competitive void. Based upon prior experience with fuel systems and the success of specific local racers it was decided that an alcohol injection system was the only option for them. In 1992 they purchased their first unit directly from Ron's Racing Products for their 383" SBC equipped dragster and experienced immediate results at the local level. 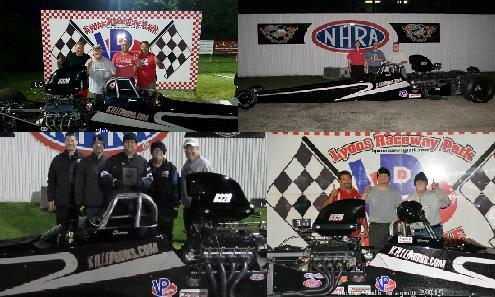 This culminated in James being named the "Rookie Driver of the Year" at Action Dragway in Terre Haute, IN. In 1994, while working a full-time job at the local hospital, James began a common "dealer" program with the Arizona based fuel system company in an effort to gain a little extra racing money. The dealership started innocently as "Monroe Sales & Service" but after nearly a decade of hard work the business had grown to a point where James could no longer hold a full-time job and care for the growing business in a manner his customers had grown accustomed to. In 2001 the KillerRONS.COM website was developed and shortly thereafter in 2004 (with the blessing of his new wife Meleah) James resigned from his day job to pursue the dream of becoming a "professional" in the industry. he annually works the Ron's Fuel Injection booth. 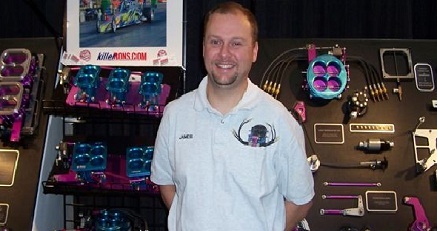 In recent years James has been looked upon by leading companies such as VP Racing Fuels and Transmission Specialties for the development and testing of new products and ideas. As the business has continued to growm, even through a sluggish economy. Today KillerRONS.COM has customers from all over the United States as well as many countries throughout the world and is responsible for a large percentage of the gross sales at Ron's Fuel Injection. Racers look to KillerRONS.COM for purchases along with fantastic technical support. 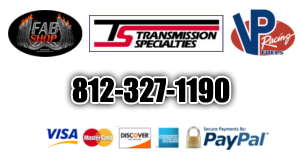 Not only does KillerRONS.COM sell and service alcohol injection systems but they also offer torque converters, transmissions, nitrous oxide systems, superchargers, data loggers and vacuum pumps. Below you will get a glimpse of what the Monroe Racing has been able to accomplish with the sole use of Ron's Fuel Injection products. Over time Monroe has purposely "pushed the envelope" by utilizing engine combinations that are commonly referred to as not being "alcohol friendly" or "capable of winning". Not only have many theories been proven wrong; they have been proven wrong on the biggest stages possible with unequaled success. The knowledge gained from these first-hand experiences is what makes KillerRONS.COM the place to go for your alcohol fuel injection system and its related components. Monroe and company do not rest on past success. In 2012 KillerRONS.COM's James Monroe and select customers began field testing and racing supercharged engine combinations using solely components in the fuel system manufactured by Ron's Fuel Injection. The results were remarkable with Monroe winning multiple events and capturing a division championship along the way. The success of these new systems will allow even more customers to benefit from the KillerRONS.COM experience in the years to come. In 2014 Monroe "retired" from NHRA Top Dragster racing to focus more closely on "grass roots" racing as well as his growing family. 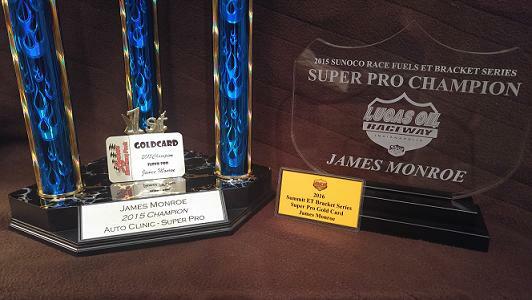 Since that time Monroe has captured five separate Super Pro track championships; four at Lucas Oil Raceway Park at Indianapolis (2014, 2015, 2016, 2017) and one at Lyons Raceway Park (2015). During that great 2015 campaign Monroe visited 9 final rounds at his two home tracks on the way to a pair of track championships. 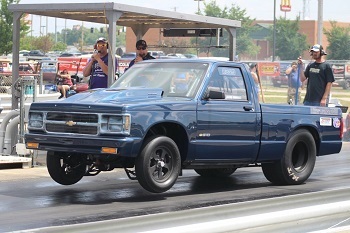 In 2018 Monroe sold his dragster operation and turned his sights on a multi-class drag truck operation in order to gain more information to assist his door car customers. The season was a success as James visited three final rounds in no-box and one in box competition. The highlight of the season was a "Wally" win at Crossroads Dragway in Terre Haute, IN in June of that season. Please take the time to look this webite over thoroughly. There are many links and pages with great information you will not find anywhere else on the internet. Best of all it is totally FREE and is updated continuously! If you have questions don't hesitate to call or email. 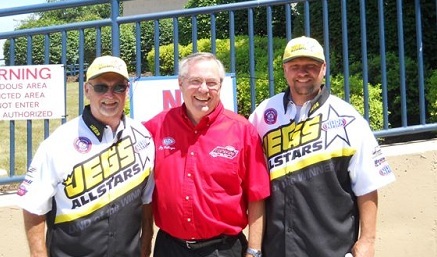 Director Jay Hullinger (center) just before his 2011 JEG'S All-Stars win. Monroe also won this event in 2013. NHRA "Sportsman Driver of the Year"
3-Time NHRA "ET Bracket Driver of the Year"